“Never doubt that a small group of thoughtful, committed, citizens can change the world. Indeed, it is the only thing that ever has.” – Margaret Mead, American Anthropologist. I didn’t think a John Deere ride-on lawn mower could make me so happy. 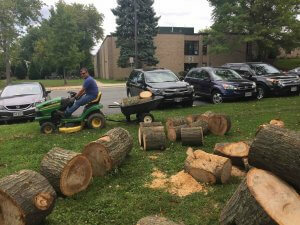 But there I was, gleefully watching a parent, Pete, load some of the 30 tree logs I had a dump truck place onto our school’s front lawn on a Tuesday, into a small trailer attached to the green machine. Pete seemed pretty content, too, riding that mower on a gorgeous Fall day towards the location of our forthcoming outdoor classroom. Pete spent 45 minutes on Wednesday going back and forth on school grounds and was able to transport half of the load. The time spent was essentially his lunch hour. 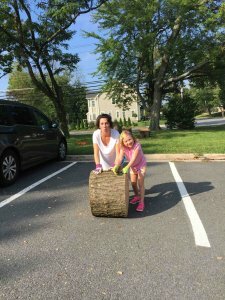 Since the day before, I had been obsessing about how I would get the logs back there – who had a pickup truck? Would it damage the grass? Could we use hand trucks or dollies? Could students roll them back, and how would I ever organize that? How many people did I need to make this happen? 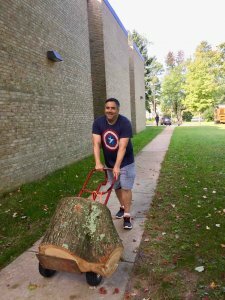 What I wanted was a large group of people – adults and children from our 500 student body – meeting up to roll logs across the schoolyard together, happy and laughing. Yet I knew that in my community, it was hit or miss to get onto people’s calendar at the last minute, no matter how much they supported an initiative. As it turned out, I was worried that I wouldn’t get enough people to help at all. And yet, once I put an announcement out to our PTA’s Facebook page and invited anyone willing to help to join when they could, Pete volunteered not only his time, but his machinery. Then I heard from a handful of others who wanted to. 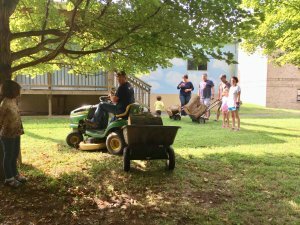 A big gathering wasn’t going to happen, but people could help when they could to get this done. On Friday, a friend and I cleared overgrown branches and brush, and removed some trash from the outdoor classroom site. That was about an hour. I put another call out to the PTA to see who could gather on the weekend for more installation work. On Sunday morning, Pete returned along with myself and four other adults. 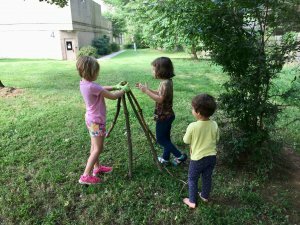 Some young kids joined in, though they were more interested in playing with downed branches than in helping us move stumps around. That was cool, though – they were playing with nature! Everyone had a smile on their faces and felt really accomplished in our work. I also made some new friends I hadn’t known before at my school. Take the pressure off yourself to do it the “right way” or the “biggest way”. Be open to having your vision be segmented into distinct, attainable tasks that contribute to the eventual goal. Don’t compromise on your vision and aspiration, but be flexible in how you reach it. Little actions can add up to great impacts. A small group of people has power. Remember to step back and see the reach of your work. Read more in my next blog post about launching the outdoor classroom to teachers and students!